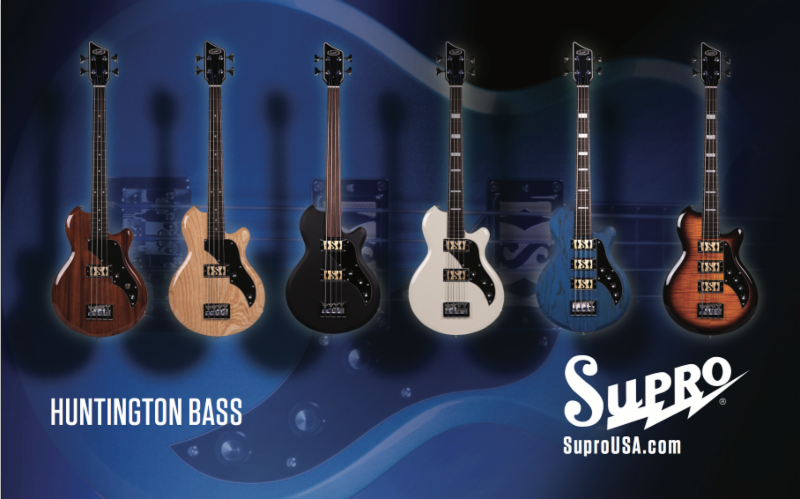 July 13, 2017 (Nashville, TN) – Supro has arrived in Nashville set to launch the Huntington family of bass guitars. This newly-designed, short-scale bass combines the classic body shape of the early 60’s Ozark model with vintage-correct passive electronics and sonic inspiration from the Supro Pocket Bass of the same era. The unique Gold Foil pickups found in the Huntington bass are authentic replicas of the original “Clear-Tone” pickups found in the vintage Supro Violin, Taurus and Pocket Bass models. These high-output single coils deliver legendary, deep low-end, with very low noise and a massive, broadband sound that stays warm and balanced across the entire range of the instrument. The Supro Huntington bass is available in single, double and triple-pickup configurations with an optional piezo bridge and a variety of unique metallic and transparent colors over a choice of mahogany, swamp ash or alder tonewood for the body. The Huntington’s maple neck has a smooth, black satin finish and 30″ short-scale length, with a glued-in, set-neck joint that provides ergonomic access to the entire rosewood fretboard. The set-neck design, premium woods and high-end hardware along with the unique, vintage-correct Supro pickups make the Huntington both a world-class recording bass and gigging workhorse instrument that is incredibly easy to play—especially for musicians accustomed to the shorter neck of a 6-string guitar. Although its scale is short, the sound of the Huntington bass is astoundingly large—boasting a tight, confident, buttery low end, articulate midrange and crisp highs. The single-pickup Huntington I model projects a warm, balanced sound with a passive tone control that acts as an “old-school” knob, taming the highs and drawing the bass deeper back into the mix. A piezo-equipped bridge option adds in an acoustic bass sound via toggle switch. When the piezo pickups are activated, the tone knob functions as a blender, allowing the player to mix in the acoustic sound to taste. The dual-pickup Huntington II model adds a second magnetic pickup in the neck position for ultra-deep bass and huge reggae tones. The neck pickup is reverse-wound for complete hum rejection when both pickups are used together. The Huntington II features individual volume knobs for each pickup with the piezo option activated by a push/pull switch on the tone knob. The Huntington II is also offered as a piezo-equipped fretless. The three-pickup Huntington III model pulls out all the stops, with a trio of full-sized Gold Foil pickups and a piezo bridge as stock hardware. The magnetic pickups in the Huntington III are wired with individual volume controls, allowing the player to dial in a tremendous range of tones, from vintage to modern and all points in between. A push/pull switch on the tone control activates the piezo pickups, which are located in the bridge saddles. With the piezo activated, the tone control functions as a blender for “acoustic” sounds or enhanced attack (especially effective for pick and slap techniques), unleashing an unprecedented range of sounds from this passive, short-scale bass. Huntington I basses start at $999 USD. Huntington II basses start at $1,099 USD. Huntington III basses are $1,299 USD. Contact your Supro dealer to preorder the Huntington for delivery in Fall 2017.